The Co-operative Bank says it is in "advanced discussions" with a group of existing investors with a view to raising new funds. The bank said it was responding to media speculation over the weekend regarding its recapitalisation. Co-op Bank was forced to offer itself for sale in February after it was unable to reach a strong enough footing to satisfy Bank of England regulations. Those rules require UK banks to be able to meet long-term capital requirements. The bank, in which the Co-operative Group still has a 20% stake, was rescued from the brink of collapse by a group of hedge funds in 2013. 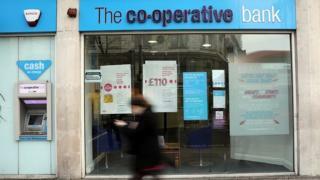 In a statement, the bank also said talks were continuing over the separation of its pension fund from the Co-operative Group's scheme. Under the current arrangement, the bank must carry a share of the Co-op Group's £8bn pension liabilities, something which is proving unattractive to potential investors. Meanwhile, the bank said that as well as exploring potential recapitalisation it was also proceeding with its sale process. Earlier this year it reported its fifth annual loss in a row, although the £477m deficit for 2016 was an improvement on the £610m loss recorded in 2015. When it offered itself for sale, the Co-op Bank blamed low interest rates and the higher-than-expected cost of its turnaround plan for its failure to meet the Bank's Prudential Regulation Authority (PRA) rules. The Co-op Bank has four million customers and is well known for its ethical standpoint, which its board said made it "a strong franchise with significant potential" to prospective buyers.